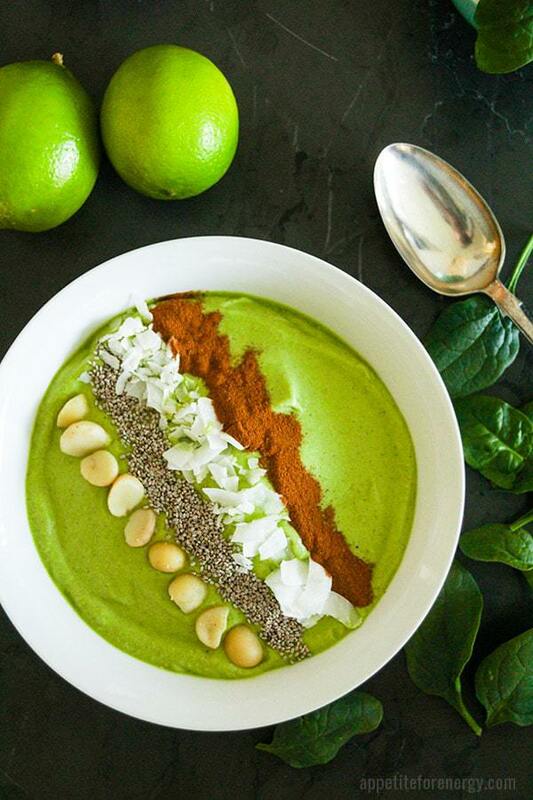 Our Green Keto Smoothie Bowl is the perfect low-carb morning kick-starter. If you want a rush of energy to start your day then a green keto smoothie does the job. There is nothing better than to whip this simple smoothie up in 5 minutes each morning and sit down to a luscious, creamy bowl of fresh low-carb yumminess. 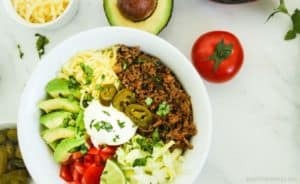 You know you’re getting a bowl of veggie goodness and since it’s also low-carb with only 7g of net carbs, you’ll feel like you’ve hit the jackpot. 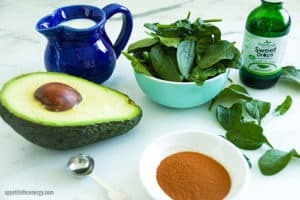 Can I Still Drink Green Smoothies On a Ketogenic Diet? Many people, including me, who start eating low-carb are huge green smoothie fans. 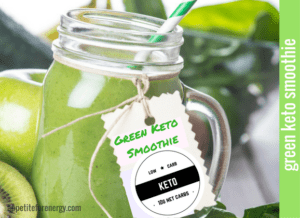 One of the first questions they ask is can I still drink my green smoothies on a ketogenic or low-carb diet? The answer is YES !! There are many recipes for green smoothies that use the same green vegetables like spinach, avocado, kale, collards and swiss chard as they tend to be low-carb. The main difference is in the fruit added and the liquids used. Often in a green smoothie, a small amount of banana, kiwi-fruit or pineapple etc is used to add sweetness. 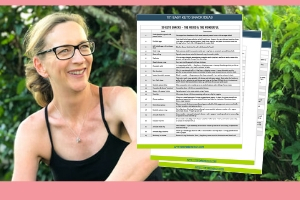 The solution is to add a low-carb natural sweetener such as stevia glycerite (liquid form) or erythritol. Adding a few drops of stevia glycerite or a couple of teaspoons of erythritol will add the desired sweetness. This just requires a bit of experimentation to find how sweet you like it. 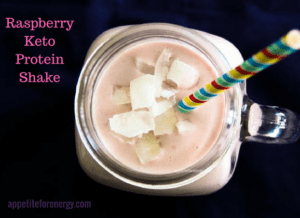 It can easily be done by adding a small amount of sweetener and then tasting the blended smoothie to see if it needs more. After you have been eating low-carb for a while, you’ll find that you don’t need much sweetener at all, if any. Your taste buds will get used to eating less sugar. coconut milk or cream. Both have similar amounts of carbs but coconut cream has a higher fat content. Choose coconut cream if you want to boost your fats for the day. This is where you can let your creative juices flow – pick your toppings and arrange in neat lines or sprinkle over the top with random flair. 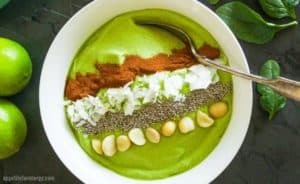 Whip up this Green Keto Smoothie Bowl in 5 minutes and power up your morning! Take it to the next level with a sprinkle of your favorite low-carb toppings. Place all ingredients in a high speed blender, adding the ice last. I love using my Nutri Ninja for smoothies as it is powerful and easy to clean. 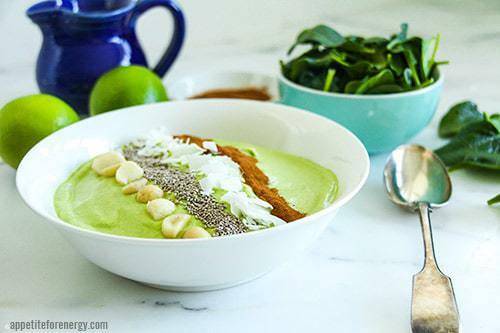 Pour into a bowl and sprinkle with your favorite low-carb toppings. Nutritional Facts below excludes toppings. You could add 1 tbsp of MCT oil powder to the smoothie if you want to increase your fats. Nice recipe Abbie! I will have to give this one a try!